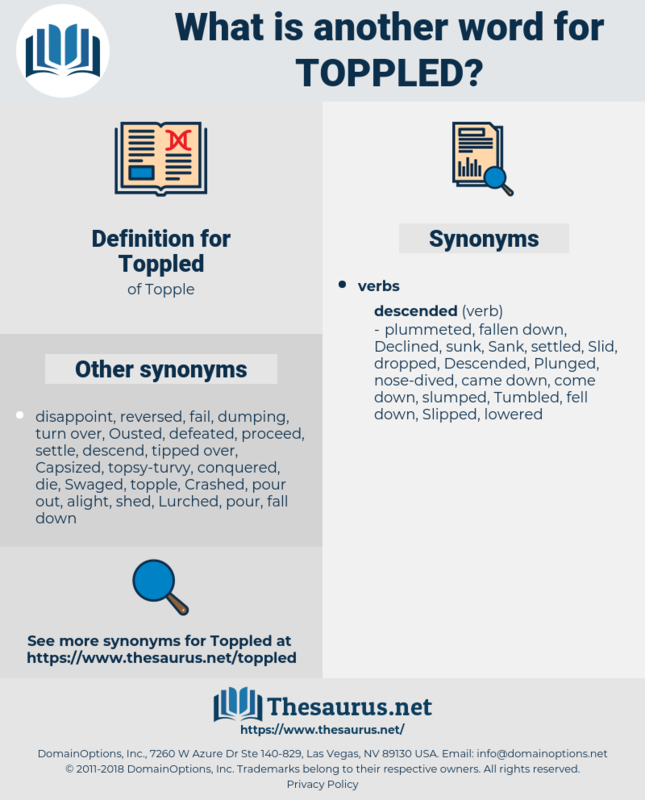 What is another word for Toppled? 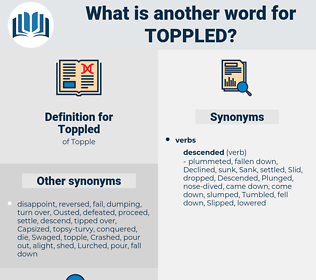 topped, Overruled, destroyed, demolished, completed, removed, collapsed, extinguished, repudiated, cancelled, thwarted, swept, terminated, led, reversed, shot, Plunged, finalized, Flipped, rolled, Knocked, concluded, Omitted, Threw, Snapped, broke, ended, Spilled, fall, fell, HIT, wrapped, turned, dumped, Brought, Caused, finished, Crashed, downed. Overruled, destroyed, overwhelmed, isolated, demolished, removed, collapsed, devastated, Interposed, upset, Rebutted, defeated, overcome, shattered, inverted, reversed, Plunged, Delivered, Knocked, Killed, dropped, ruined, thrown, Spilt, fallen, Spilled, Achieved, HIT, struck, turned, landed, Shifted, Screwed, shocked, Brought, downed, gone. It won't be the first that we have toppled over. I pulled frantically, seeing visions, meanwhile, of the boat and myself being toppled off the side of the rock, into the boulders and waves below.